LONDON –Dillian Whyte delivered a Knockout of the Year candidate with a devastating left hook in the 11th round in a dramatic rematch of one of 2016’s best fights between two top-rated heavyweight contenders Saturday in London in a SHOWTIME BOXING INTERNATIONAL telecast from The O2 Arena. 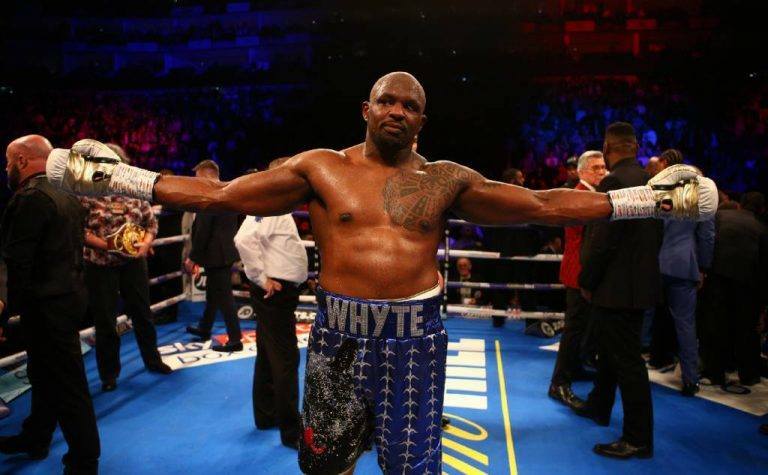 With the win, Whyte now has the inside track at a world title fight in 2019. Whyte (25-1, 18 KOs), who entered the fight holding the No. 1 ranking in the WBC and WBO, used a lethal left hook in the eleventh round to end the rematch, which was just as thrilling and memorable as the 2016 clash, in dramatic style. The highly competitive, back-and-forth bout was evenly contested from the opening bell. Chisora (29-9, 21 KOs), who was perhaps the more aggressive fighter, was deducted two points, once for a low blow in the eighth round and once for an elbow in the 11th round. Despite the two-point deduction, Chisora was ahead on two scorecards, 95-94, at the time of the KO. Anthony Joshua, who called the fight ringside for Sky Sports, went face-to-face with Whyte following the bout. Saturday’s SHOWTIME BOXING INTERNATIONAL telecast will replay on Monday, December 24 at 10 p.m. ET/PT on SHOWTIME EXTREME and will be available on SHOWTIME ANYTIME® and SHOWTIME on DEMAND®. The one-fight telecast from London was hosted by Brian Custer and Hall of Fame analyst Steve Farhood. Live fight coverage was provided by Sky Sports Box Office with Adam Smith calling the action and former world champion Carl Froch and Joshua providing expert analysis.